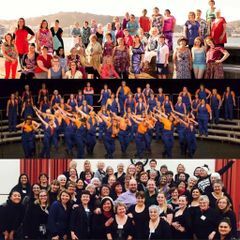 Hosted by Wellington City C.
Wellington City Chorus offers a contemporary, dynamic and distinctive style of singing for women. We rehearse on Monday evenings, 7pm - 10pm at the Wellington Bridge Club, 17 Tinakori Road, Wellington. Every rehearsal is an open rehearsal. Please come along, see what we're about and if this style of singing is for you. All ages and voice ranges welcome! The ability to read music not necessary.